The Board of Regents approved a tuition increase today of $250 for in-state students at the University of Iowa, Iowa State University and the University of Northern Iowa. That increase is $50 less than what had been proposed. 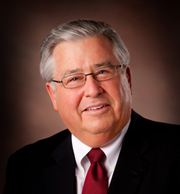 Regent Larry McKibben of Marshalltown also expressed concern. “As everyone here knows, the tuition increase has been an issue that has been difficult one for me, when we initially discussed it and the proposals came out as late as they did, I was on the other side of it,” McKibben says. He made the motion today for the amended increase and says he knows that’s how the process sometimes works. McKibben says he’s heard a lot of concern about the increase while also hearing about the need to maintain the quality of education at the three schools. “So at the end of the day, you come to the floor of the debate and you are very conflicted about which side that you are going to pick. I was pleased to hear the governor say that he though some sort of adjustment needed to be made for Iowa in-state students,” according to McKibben. Governor Terry Branstad said the proposed increase was too much. Student regent Rachael Johnson from the University of Northern Iowa also talked about the increase. “Raising tuition is never something that I take lightly, never something I look forward to, but often times it is necessary,” Johnson says. “And when you look at today’s proposal, you can easily see the necessity when you see the dwindling amount of state support, and the necessity voiced by all of our universities.” Johnson also cited the comments from the student leaders at the three schools. “They all supported raising the cost of tuition at our universities to help increase services and to not only maintain the quality of education they are receiving — but to help further enrich it,” Johnson says. While she supports the tuition increase, Johnson says the Board of Regents should again review the way tuition rates are set as they prepare their strategic plan. “I think it is our responsibility as a governing board, and as good stewards of taxpayer dollars, that we ensure that the model we are using for tuition is the best for our universities, our students and all Iowans,” Johnson says. Regents president Bruce Rastetter of Alden said he could support the modified tuition rate after asking the presidents of the three schools if they could handle a drop of $50 in the proposed increase. “Which is just shy of a half-million dollars at U-N-I, just shy of $700,000 at Iowa, and just shy of a million dollars at Iowa State. And they assured me that they could,” Rastetter said. The vote on the tuition increase came after the board approved an $8,000 performance incentive for Regents executive director Bob Donley. Donley’s salary has reached the maximum $154,300 dollars allowed by law, but the Board of Regents has continue to pay him performance incentives above that salary. The board also approved a 2.5 percent increase in salary for the superintendent of the schools for the blind and deaf. His salary moves from $185,400 dollars to $190,035 dollars. Rastetter says the presidents of ISU and Iowa asked that they not receive a salary increase at this time. The board is currently searching for a new president for UNI.